Enjoy a healthy meal together for Valentine's Day. Besides love, the other major factor in Valentine's Day is candy! Between heart-shaped lollipops, chocolates and even edible roses, there's often not a healthy bite in sight. Your senior loved one can enjoy a sweet treat without all the processed sugar and dyes by indulging in some fresh fruit. "Fruit offers a sweet yet healthy alternative to candy." If the person is diabetic, look for sugar-free varieties of his or her favorite candies. Blood sugar spikes caused by eating V-Day sweets can wreak havoc on a senior's energy levels, causing a period of high activity and then a sudden crash of tiredness. Fruit provides a naturally sweet option that is also full of vitamins, antioxidants and fiber, which promote healthy digestion and overall well-being. The memory of seniors with Alzheimer's and other forms of dementia often amazes friends and family. 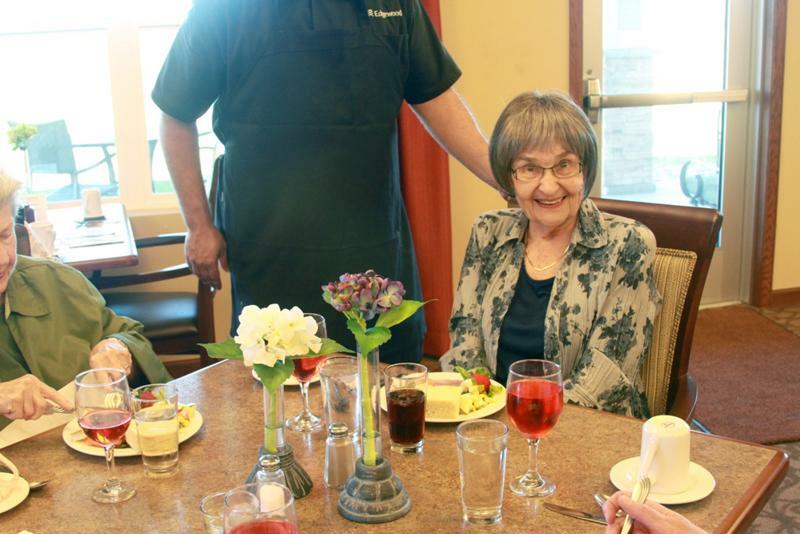 They may not recall the location of their assisted living memory care community or where they went for lunch, but they often do remember things from years past. This Valentine's Day, bring some photographs when you go to visit your older loved one. Take along shots of his or her childhood and important moments in the person's life. Believe it or not, the senior will be more likely to remember these long-ago occurrences than something that happened last week. Many individuals with Alzheimer's feel lost and confused in the present, but in the presence of the past they perk up and their memories clear. You may even feel like the "old" version of your friend or relative is back as he or she vividly recalls an infamous sibling skating rivalry or the moment of someone's birth. Everyone has a list of songs that instantly take them back to a particular memory. On Valentine's Day, bring along some music you know your senior friend enjoys. Maybe play something he or she used to listen to as a kid or even the song that played at his or her wedding. Just like looking at a photo, hearing a familiar melody can transport someone with Alzheimer's to another time. If the person is physically able, you could even dance together. For slow music try a simple couple's dance or get jazzy to a fun big band number. The music will serve as a trigger to the person's memory, providing a mental workout. Add in some dance moves, and you're bringing the senior both joy and a fun way to exercise! It's important to remember that Alzheimer's comes with good and bad days. You may get lucky and find your senior loved one is having a particularly good day and he or she is aware and excited when you visit to celebrate V-Day. It's also possible that the person won't remember your name. That doesn't mean you should leave. Instead, just enjoy his or her company as if you were a stranger who came to visit. The individual is sure to appreciate your company regardless of who he or she thinks you are. You can also ask if the senior's memory care community offers a Valentine's activity such as card-making or an open house. Join your older loved one at these affairs to spend some quality time together while celebrating the holiday of love.